Why is you + rats = true? Why does your heart beat faster and faster when you hold your little ratties? Why not join this group? 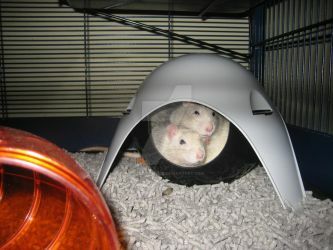 Because this group is about rats, and not just normal or wild or boring rats, but your smart, funny and lovely pet rats! Featured: Snoopy Rat eating a crouton on my chest. Featured: Look i'm In a Tube! We do only accept photos. As in all groups, I will mention it here: it has to be your art! If you steall or copy, your art will be deleted from the group, and you will be blocked out! 2. How do I watch the group? 3. How do I submit? 4. What means with a rat? 5. Can I be both member and contributor (or co-founder)? 6. If I have more questions, who and where can I ask? 1. To join is very easy. At the top you see the JOIN market. Click on that, then you might write a little about you (if you want) and send the join request. Attention! We only explain why the photo was rejected, but not why you got rejected from joining in this group! 2. If you want to watch the group, please look up at the panel, where you usually find the market WATCH. Click on that, and the job is done! 3. We in this group will that you can submit in the featured, but I’m sure that folder will come. Go to the featured, and in the right corner, you see +Submit to this Gallery. Then you have to click on it, and find the work you want to submit. Then you click on SUBMIT, and the work is done. Then you have to wait for the approval. 4. A rat, is a hairless, or fancy or dumbo (and so it goes). We do not accept normal rodents, like guinea pigs or hamsters. These photos will be declined. 5. I'm sorry. No. You can not be a member and a contributor in the same group at the same time. But if you want to change your status, you can send a note to *BangaLiquid and ask if you could be a contributor, or a member or a co-founder (only if you are member of the group, if not, use the normal JOIN process as usual). 6. If you have more questions, you can write it in the comments on the page, or write a note! Since this group doesn't seem to have an Admin anymore I have taken up moderating your entries. The normal rules still apply because I can't change them. And I also can't choose folder favourites. Do keep posting your rat photos here though. They are more than welcome. although you don't know me,you blocked me because of one comment ...thank you for your "quick condemnation"
I forgot to give my thanks for accepting my request to become a member of this group! Thanks a bunch! Thats it for now! Bye! My lovely girls have all been so much fun, and each has her own personality. They're lovely to play with, or even just watch. They're lovely little creatures. Very full of love, and I also find them fascinating. Also, they've inspired me to start making hammocks. I have a couple of classics made so far, but I've got sooo many ideas (including one very special design) that I'll be concentrating on once I'm back from my little holiday. I must ask, why do you have categories sorted after colors ?? Simon died Thursday morning, I saw it coming though from when I first rescued him. He was roughly 3 and unfit as it was when I got him, estimate him at maybe four years when he died. I hope you find another deserving one someday and never have to go thru that again. Sometimes you come across The One and you never find one like it again, but still have enough love for others too.